…you have 500,000 skewers in your kitchen but never ever make kabobs. …your husband makes steak and baby back ribs on a (one night) camping trip. …he offers to make you breakfast then hands off the order to his favorite line cook. …your husband breaks out the electric griddle, puts it on the dining room table, and cooks teppan food for your family. This of course includes lighting the onion volcano. …you forget to check pockets and end up washing a spoon, a lighter, a small notebook, a rubber glove, a sharpie, etc. The list could go on and on for this one. …you have a million black sharpies in your house but all your pens seem to go missing. 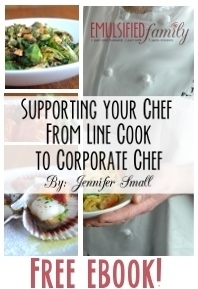 …you have cast iron pans and he gave you direct orders on how to clean and take care of them. …he invites you and your kids over to dinner and cooks enough for the entire neighborhood. …you can’t stick to a grocery budget if he goes to the store. …all he makes at home is a tomato sandwich at 2 am (yes tomato, mayo and bread). …he works at a fine dining restaurant, yet his favorite go-to food is Top Ramen. …you get woken up at 3am by someone yelling “service please” in their sleep. …you have teeny tiny notebooks everywhere. …you get woken up at 5 am by someone getting fired, only to find out your chef was talking in his sleep again. …your husband is shopping for a home sous vide machine to start making sous vide dog food for your dogs. …your dishes are white because you plate food for every meal. …every open box of cereal gets transferred to an air tight container and is dated with blue tape and a sharpie. …he freaks out about improper food handling/dethawing ways. …every time you go out to eat, he spends the entire time critiquing the menu and service. …you go on vacation and the entire trip is planned around where you are eating. …you have every kitchen appliance/utensil in the house but a slow cooker is frowned upon because its cheating. … you have a fire extinguisher in the kitchen and have had to use it! 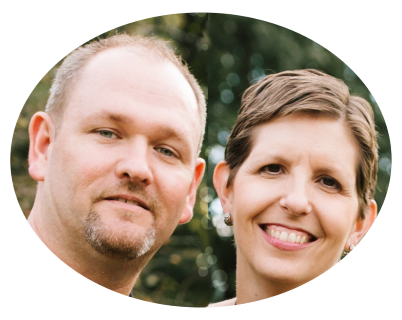 …most of the conversations you have with your spouse are about food. …80% of your conversations are through text message. he goes grocery shopping at 5 different stores and comes home empty-handed because “they didn’t have anything good”. he tells you he has a half day but it’s longer than everyone else’s full day. …your chef orders an industrial can opener for the home. …you prep supper and throw out the ground beef package so he doesn’t see how low the percentage is….just so you could save money. …any conversation no matter how serious, life changing or silly is generally done by text. 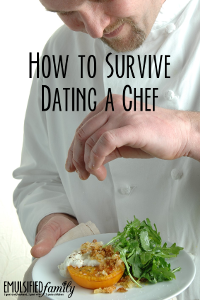 …you occasionally have to remind him you aren’t a cook so don’t talk to you like you are. …you ask Chef how long something will take (even non-food related) and you get a generic kitchen response of “x minutes”. …you say you want some cooking gadget and he tells you the only cooking gadget you need is a knife. …he offers to make a “snack” of crackers and cheese and 15 minutes later comes out with a HUGE board covered in crackers with all different toppings on them, all laid out neatly. …you own hundreds of cookbooks that you can’t count anymore and movers give you that dirty look when they pack and move them for you. …he makes a mis en place when cooking dinner at home and dirties every little bowl you have. your kids’ school projects always have something to do with food or cooking. …somebody asks how long to cook something and you say, “until it’s done”. …your days off together always consist of food and wine!!!! …when cooking, he says, “Behind” and say you say, “Heard”. …every recipe calls for gallons instead of cups. …having a fancy dinner at midnight is not weird, but a regular occurrence. …you know what “chef’s arse” is. …you use dish towels to wipe up everything in the kitchen. What would you add to the list? Let me know in the comments below! Haha! It’s so funny that so many of them apply to so many of us!! Also not sure about everyone else, but when my chef cooks, it’s a storm and ship wreck in the kitchen – sauces all over the counter, kitchen sink overflowing with dirty pots and pans… and a delicious meal of course! haha!!! I relate to all of this. When chef cooks at home, it also looks like a ship wreck after with the sink full of pots and pans and sauces and cream every where – usually I have to do all the cleaning up! Yes!! So many dishes!! 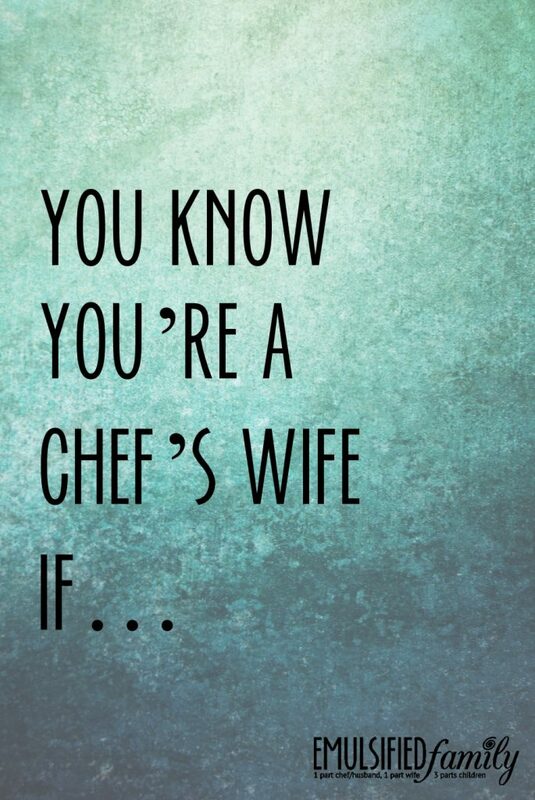 Although, my chef/husband has gotten much better over the years and uses far less dishes and cleans as he goes. I’m very thankful for that! This list cracked me up! We have 137 sharpies! No lie! Probably even more pens, but they are never to be found when you need one! Small notebooks/sticky notes all over the house, the white dishes, almost all of it! We chef wives have to stick together! We’re like military wives! LOL! Your blog is hilarious, inspirational and truly amazing! I am so happy I found your blog. I finally feel that I am not the only woman in the world who feels this exact same way! You nailed it right on the head, sister. Haha…you are definitely not the only one.